In these pages, I have consciously made scant reference to my ongoing service in the United States Army for a most obvious reason– to keep my official duties separate from personal ramblings. For the most part, maintaining the separation is easy, since the usual subject matter of this site has little to do with my daily military life. Certainly, there can never be a clean demarcation between the personal and the professional, for everything is, in the final analysis, a personal matter. Therefore, where appropriate, I have indeed referred to some of my military experiences, not so much to highlight the exemplary service of the men I’ve been privileged to lead, but merely as an aid in expressing some theological or philosophical idea. 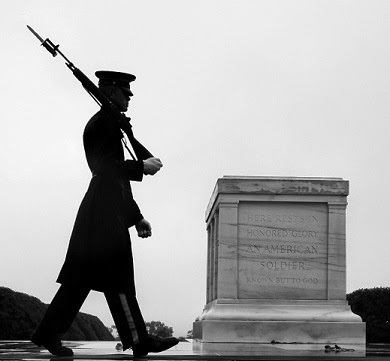 As America readies for summer, however, the approach of Memorial Day occasions a fitting opportunity for me, as an American veteran and a man of faith, to reflect on the profoundly personal– and yes, theological– significance of this weekend’s commemoration. With a few years of service and a trip to Afghanistan under my belt, people frequently thank me for my service (and the flattery is always humbling and a bit embarrassing, no matter how often it occurs). On Memorial Day, however, it seems that people go out of their way to greet me, and I even get a few emails from old acquaintances with a short “thanks for your service” message. While I remain immensely humbled, these Memorial Day greetings, more than any other greeting on any other day, also leave me intensely ashamed. My heart immediately goes out to the many other servicemembers who have given more than me, deserve more than me, and who rarely receive the acknowledgement that is rightly theirs. Why my shame when others thank me on Memorial Day? The answer is simple: I am alive. Memorial Day is not a celebration of living servicemembers; for that, we have Veterans Day. It is not a day meant for me, but a remembrance of the fallen. Accordingly, with each greeting and handshake I receive on this day, I cannot help but feel that I’m unworthily taking some of the recognition that rightly belongs to souls far braver than mine. For most Americans, Memorial Day weekend signals the beginning of summertime fun: it’s a time for barbecues and cookouts, road trips, commercial promotions, aquatic activities, the end of school, and the start of vacations. All these have largely overshadowed Memorial Day itself and obscured its original purpose. Of course, when prompted, some Americans will dutifully (if mindlessly) execute a knee-jerk “thanks to the troops” before readily returning to the leisure at hand. Here too, the essence of the holiday has withered away, forgotten in favor of more pleasurable activities. Less than one percent of all Americans ever wear the cloth of our country, fewer have gone to combat, and fewer still are those who left everything on the battlefield. The emergence of the all-volunteer force, while a laudable development in national policy, also left an unintended consequence: statistically, the vast majority of the American populace is now several degrees comfortably removed from the trials of troops and their families, and this ever-widening civil-military divide is evident in the way most Americans celebrate Memorial Day. War no longer touches the average citizen; it a strange and distant phenomenon neatly packaged in short blurbs on the nightly news. 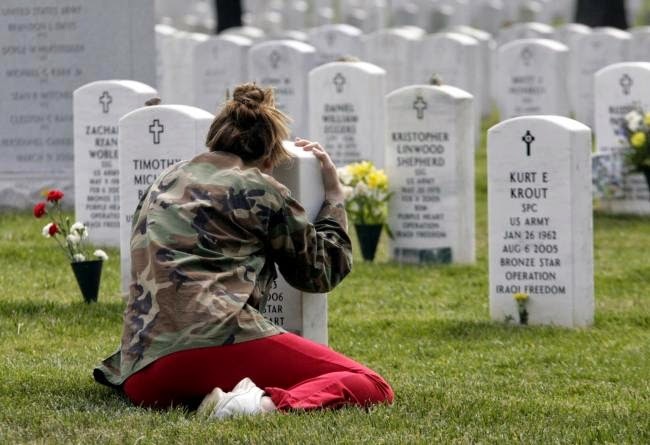 Tragically yet unsurprisingly, the conduct of most people on Memorial Day seems to indicate that we as a society have forgotten the very “memorial” we are supposed to remember. Despite the lip service and patriotic platitudes of many, in reality we as a people think little of the burdens shouldered by those who have gone to war at our country’s bidding; because of this, we often fail to recall that the ultimate sacrifice of so many courageous men and women constitutes the very foundation of the our present reality. What has this to do with faith and theology? Abraha et semini eius in saecula. When Christ instituted the sacrificial feast of his Body and Blood, he commanded his Apostles to “do this in memory” of him. While his followers, dejected after his crucifixion, walk at his side on the road to Emmaus, they fail to notice the identity of Him with whom they spoke; only in the breaking of the bread– the presentation of the sacrifice– do the disciples, with hearts aflame, recognize the risen Lord. And after the Paschal Mystery– the sacrifice of Calvary– was made perfect in the resurrection, only then were the eyes of the Apostles opened to recall and recognize all in the Scriptures that prefigured the life and death of the Messiah. Sacrifice precedes and begets present reality; through our memory, we continually unite ourselves to that foundational sacrifice. Anaphora and anamnesis are then intimately linked to an even older term for the Christian liturgy: εὐχαριστία (eucharistia), or “thanksgiving”. In the course of time, our tradition has come to consider anaphora and eucharistia one and the same; indeed, in some older copies of the Roman Missal (and also in the Mozarabic missal of Toledo), the Eucharistic Prayer is often called not canon according to usual custom, but actio gratiarum— a direct reference to the tibi gratias agens from the words of institution. The sacred liturgy is a kairos moment that continually lifts us and carries us (anaphora) out of the normal flow of time (chronos); through a recollection of the Paschal Mystery (anamnesis) and a thanksgiving (eucharistia) which imitates Christ’s act of thanks, we are brought into the heart of Christian existence, that is, the expiatory sacrifice of the Cross which transcends all time. If we fail to honor this memory, what do we have left? If anamnesis gives way to amnesia, what hope remains? We would be cut off from the very source of our reality, without which everything is lost. The early Roman Christians, who risked their lives to celebrate this same memoria Domini, knew that the liturgy was the necessary link between them and Christ, hence their famous desperate cry: sine Dominico vivere non possumus! If a shared public religiosity ever existed in America, holidays (“holy days”) are among the last vestiges of a civic liturgy. Our national observances, established by statesmen who (despite secular objections to the contrary) were still deeply informed by biblical faith, take the ancient Sabbath– itself a form of “memory”– as their archetype. On the seventh day, God rested and looked back– he remembered all that he had done in the act of creation. For man’s part, he is called also to abstain from work and likewise “remember” all the mirabilia wrought by God, thus giving thanks to the Lord for his grace and mercy. The Federal holiday is our national form of anaphora with a corresponding anamnesis and eucharistia. We suspend the normal flow of time, “carrying ourselves back” to the watershed moments of our history. Whether we commemorate specific people (President Washington; Martin Luther King, Jr.), specific groups of people (veterans, laborers), religious events (Christmas), or significant anniversaries (Independence Day), the fundamental purpose of a holiday is never leisure as an end in itself, but the solemn contemplation of those contributions which have indelibly shaped the American experience. On Memorial Day, a feast with the idea of “memory” explicitly built-in, we are charged to remember and thank those who have made of their sundered flesh a fragrant oblation for our country. Once more citing the Roman Canon, we dare to raise unto God’s memory all those “who have preceded us with the sign of faith and rest in the sleep of peace”. As in the Catholic liturgy, where our memorial actions bind us to the Paschal Mystery, our commemoration of the fallen likewise makes their sacrifice ever present, and as long as we keep their memory alive, their deaths are not in vain. Americans owe to the memory of the slain much more than one day of the year; the least we can do is not only to abstain from work, but also to abstain from excessive indulgence, in order to worthily honor and thank those lost to the ravages of war.Lay Catholics: pray a rosary for their repose or offer Mass intentions for the expiation of their sins. Reverend Fathers: celebrate a Requiem Mass in their honor. Americans: visit a national cemetery or war monument, participate in a Memorial Day ceremony, and fly your flags at half-mast. All these ways of reverently honoring the memory of the fallen should be at the center of this weekend’s celebrations. Let not our day of anamnesis yield to amnesia; let not our dead suffer an ignominious damnatio memoriae. They deserve better, for they are our best. In light of what I’ve written above, I would like to commemorate one particular fallen warrior. Jennifer Moreno and I were classmates at the University of San Francisco, where she studied in the university’s highly-rated, rigorous School of Nursing and Health Professions. Both of us were enrolled in USF’s Army Reserve Officer Training Corps (ROTC) program, and in May 2010, we both graduated and earned our commissions as Second Lieutenants in the United States Army. A daughter of Mexican immigrants and born in San Diego, she was the first in her family to graduate from college, where she excelled. Jenny routinely exceeded expectations and was a consistent top performer both in USF’s nursing program and in ROTC. As a nursing student, she was never destined for a job among the Army’s combat arms branches; nevertheless, Jenny manifested a sound knowledge of dismounted infantry tactics at the squad and platoon level. She exhibited a finely tuned aptitude for leadership, and despite her pint-sized frame, her physical fitness put a good number of the boys to shame. After graduation, she was assigned to Madigan Army Medical Center at Joint Base Lewis-McChord, Washington. During this time, as the “surge” in Afghanistan was taking effect, the all-male U.S. special operations forces in Afghanistan faced the growing problem of more local women on the battlefield. In order to win the favor and trust of the Afghan populace, American forces, even the hard-hitting special operations units, needed to account for Afghan-Islamic cultural sensitivities. In this context, male troops could never interact directly with women without offending the locals and jeopardizing hard-won security gains. Women could only be questioned, searched, or touched by other women. In response, the American special operations community formed what have variously been called “Female Engagement Teams” (FETs) or “Cultural Support Teams” (CSTs), groups of high-performing, hand-selected female troops to help the elite all-male units such as Army Special Forces (Green Berets) or the 75th Ranger Regiment in interacting and dealing with female local nationals. Normally, the women recruited for the CSTs came from Civil Affairs, Psychological Operations, Engineers, Military Intelligence, and Military Police– branches of the Army with competencies related to the CST mission. But Nurse Jenny– and she was already an outstanding nurse– was up for a new challenge. She applied for and was accepted into the CST selection course, a highly specialized, physically demanding regimen designed to identify only the best qualified candidates for the Cultural Support Teams. Jenny was eventually selected, and for those of us who knew her, it was hardly a surprise. In late 2013, Jenny deployed to Afghanistan with a CST attached to 3rd Battalion, 75th Ranger Regiment, which conducted special operations throughout Kandahar Province, Afghanistan. Although we never got to meet in Afghanistan, I did talk to her a few times before we both deployed, and I found out that we would be operating in the same part of the country. My platoon of 27 soldiers also executed near-daily combat patrols throughout the entirety of Kandahar Province, but with a greater focus on training, advising, and assisting Afghan Security Forces. The Rangers and their supporting CSTs, by contrast, conducted more direct action strikes against known Taliban high-value targets (HVTs). On 6 October 2013, the Rangers received a tip about the presence of an important Taliban bombmaker in the Zhari District of Kandahar Province. A Ranger platoon, with Jenny in tow, loaded into helicopters and departed on a night raid to kill or capture the HVT. Once the Rangers landed and approached the target building, a female came out the front door and approached the Americans. Before any of the Rangers could react, the woman detonated her hidden suicide vest, initiating several other pressure plate and tripwire-activated improvised explosive devices (IEDs) hidden throughout the compound. In the ensuing chaos, Jenny, a nurse to the core, unhesitatingly rushed into the fight to help her wounded comrades. I am privy to many of the horrible details of that night, much of which is not available on public record. Due to the sensitive nature of the operation and out of respect for the troops involved, I will spare the full narrative. For the curious, this Army Times article summarizes most of the available open source material which, although shaky on some details, adequately paints the story in broad strokes. In any case, while she sustained fatal wounds from subsequent explosions, Jenny never ceased to give combat first aid to her broken brothers-in-arms, and while doing so, she heroically gave her life. The mission left three other Americans dead and around two dozen seriously wounded, rendering that Ranger platoon combat-ineffective for the rest of the deployment. By all accounts, however, Jenny’s actions under fire helped to keep other Rangers from returning home under American flags. Posthumously, she was promoted to Captain and received the Bronze Star for Valor. Obviously, her death shocked all of us who knew her. It was hard to believe that our short, sweet, sassy, tequila-loving friend from college– and a nurse– would be the one to die in combat in that manner. A few days after her death, I saw the surveillance feed of the raid, and I recall the overwhelming sense of incredulity which took hold of me. Watching the explosions that killed my friend ranks among the most surreal experiences of my life, and psychologically, it was the lowest point of my own deployment. And yet, when the dust had settled and the tears had dried, looking back, I don’t think any of us could imagine Jenny doing anything less. Exceeding expectations was always in her character, and on 6 October 2013, Jenny exceeded us all through her invincible loyalty, commitment, and sense of duty to her fellow soldiers. Although any attempt at a tribute will fall hopelessly short of its subject’s magnitude, mere silence would fall shortest of all. 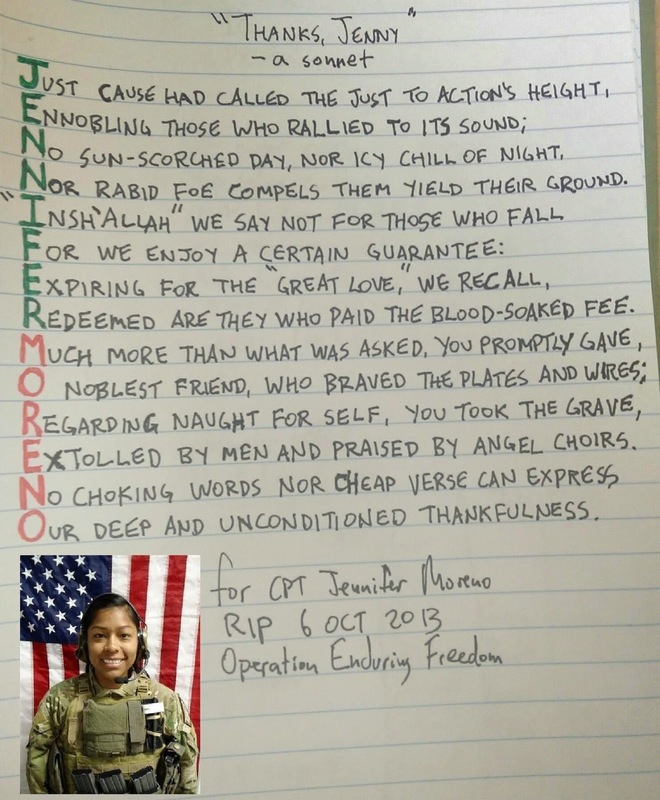 This is my anamnesis: a small, stuttering sonnet I composed in Afghanistan, dedicated to fellow Army Officer, a college classmate, and a friend: Captain Jennifer M. Moreno.